What we can provide are trees and/or benchgrafts of 29 tradiitonal European cider varieties for apple growers wishing to experiment. Most of our foundation scionwood was originally obtained from Washington State University's Experiment Station at Mount Vernon, as well as from the National Clonal Germplasm Repository for Apples at Geneva, NY. Dr. Jackie King and her staff at Mount Vernon have pioneered in the testing of European cider varieties, continuing a project begun by Dr. Robert Norton back in 1979. Their Annual Report 2003: Evaluation of Apple Cultivars for Hard Cider Production provides valuable information for anyone contemplating serious cider-making. This report may be accessed through the W.S.U. website (http://mtvernon.wsu.edu - clickon Fruit Horticulture). During the 17th century, Herefordshire, in the English' West Country', became famous for the quality and quantity of its fermented apple cider. This reputation was mainly predicated on the Redstreak variety, now rare, but still an excellent bittersharp for the home cider orchard... Illustrated by Robert Hogg (1818-1897), scab warts and all. 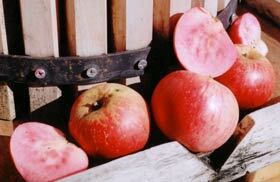 Etter pink-fleshed varieties provide a colorful sweet/sharp addition to cider blends. With their complex mixture of sweet, sharp, and bitter elements, the traditional European cider varieties have proven themselves the ultimate apples for this purpose. Unfortunately, most of them are not very good for other uses, particularly fresh eating. So cider-making at this level demands a serious commitment. Of course, any apple variety can be pressed into cider. American cider has always relied on a blend of several varieties . Some apples favored by old-time cider makers include American Pippin, Baldwin, Bullock, Esopus Spitzenberg, Golden Russet, Roxbury Russet, Smith Cider, Sops of Wine, Wagener, and Winesap. These varieties would generally fall in the "Sweet" or "Sweet-Sharp" categories. Likewise, high-flavored European culinary and dessert varieties like Ashmead'sKernel, Bramley's Seedling, Court Pendu Plat, and Egremont Russet are very suitable for cider blends. And while most modern varieties are a bit bland for great cider, Etter apples like Waltana,Katharine, and Etter's Gold can hold their own with the older heirlooms. The main fault with varieties listed above is a deficiency in the bitter, tannic element. Indeed, connoisseurs have frequently criticized American hard cider for lacking the body and savor that derives from tannin. In the old days, the bitter component could be acquired from the "wild" seedling apples and crabs that sprouted up all over the American landscape. 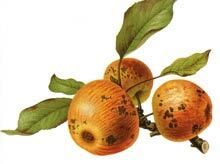 Henry David Thoreau's essay Wild Apples documents the qualities of these feral fruits for cider blending .
" No wonder that these small and high-colored apples are thought to make the best cider. Loudon quotes from the Herefordshire Report that 'Apples of a small size are always, if equal in quality, to be preferred to those of a larger size, in order that the rind and kernel may bear the greatest proportion to the pulp'...."
Nowadays, cider-makers can utilize crab varieties for adding the tannic element to their blend. Dolgo Crab, for instance, works well as a "Bitter -Sharp". Even more astringent and acidic is Niedzwetzkyana a.k.a. Redvein Crab; its deeply pigmented red flesh adds some color to the blended cider. 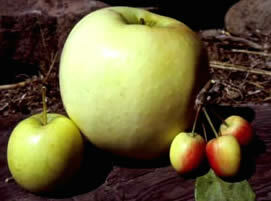 We also recommend the Etter crab hybrids for fine cider and "apple wines". Wickson Crab, of course, was introduced for this purpose. Some of the Sweetmeat Crab ™ Hybrids like Eden™ and Muscat de Venus™ may be regarded as "vintage" varieties capable of producing a fine beverage without blending. Etter Sweetmeat Crabs ™: Little apples with big attitude - Perfect for the press.